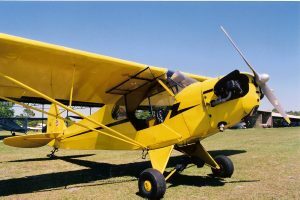 Whilst working for an extended period with Lockheed Martin in Florida, I had the opportunity to do some flying from a back-country airfield north of Orlando and near Lake Apopka, called Bob White Field. I flew in a number of interesting aircraft there, including the J-3 Cub. The PDF file below, which is extracted from the draft manuscript of Ron & Jim Smith’s aviation memoir ‘Two Up’, tells the story.